Lingering flu-like symptoms? Head cold? Sinuses blocked? Perhaps you are suffering because of chemtrail fallout. 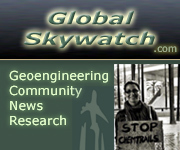 An in-depth post about the chemtrail flu: Chemtrail flu – have you got it yet?. From 2001: Chemtrails: Delivery System For Dept. of Defense’s Toxic Cocktails. 936hz and 852 hz alleviate third eye calcification and impairment. 528hz acts as a general balancer. The following tones target the sinuses and may greatly help reduce your anguish from flu and cold like symptoms. Be sure to use headphones.